Bob De Moor is know for having drawn a lot of drawings on all kind of documents. 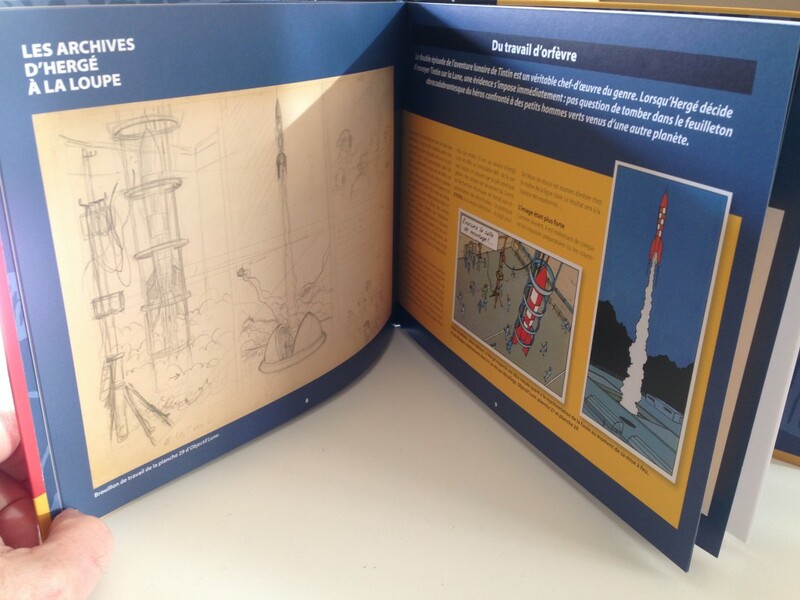 Today we present you a Studios Hergé document which was recently auctioned for a little more than 350 Euro if memory serves me right. 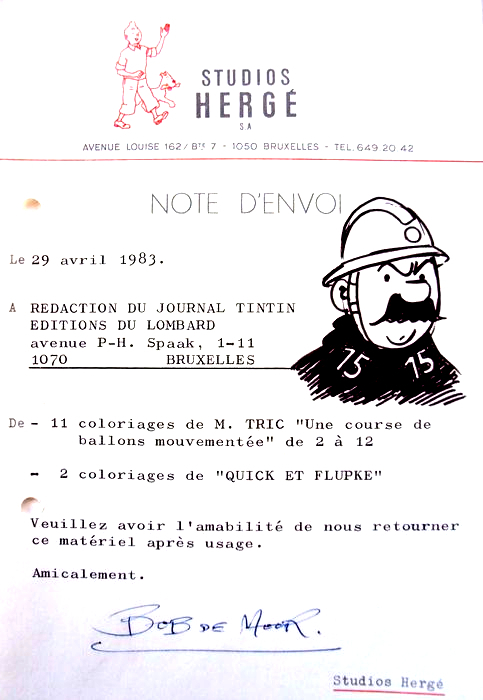 The document is actually a memo which was used by Bob De Moor to clarify that he had sent 11 coloured pages in the Monsieur Tric series to the Tintin Journal offices situated at the Editions Du Lombard. The pages sent were for the story “Une course de ballon mouvementée”, which was originally published in 1955 but re-published in colour in 1983 (the print was done in a very poor way we must say, it’s a mystery how that ever left the pressing plant to begin with, but more on that later). 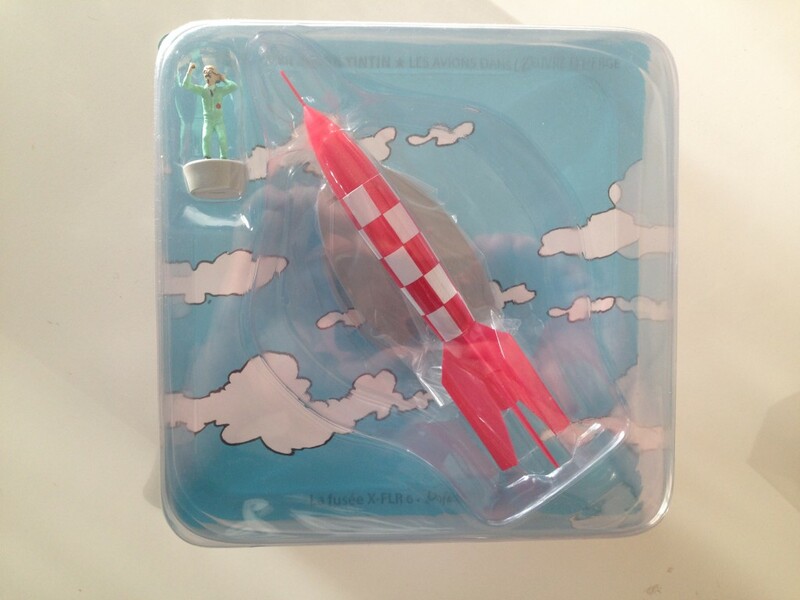 Also included in the memo was the information that 2 coloured Quick & Flupke pages were shipped off to the Tintin Journal offices. The letter dates from 29 April 1983, about 2 months after Hergé succumbed (3 March 1983), which shows the studio was at that time still functional and producing (new) material. But Bob De Moor fans are of course mostly interested in the quick drawing Bob De Moor added on the memo, namely one of Officer No. 15 (Agent Nr. 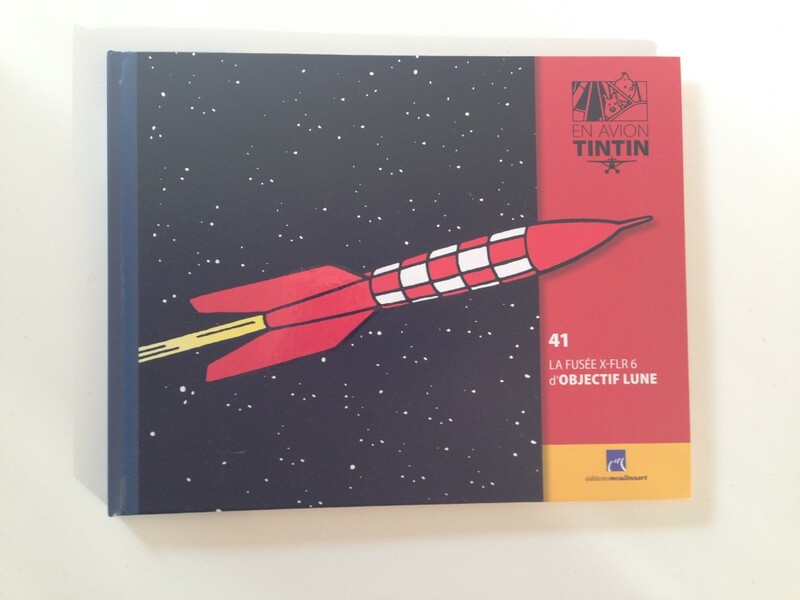 15 in French) which you must know from the Quick & Flupke series. Like said earlier, De Moor did a lot of these drawings on documents he sent off to the Tintin Journal offices featuring a set of characters, from Blake & Mortimer to Tintin. It kinda shows that De Moor was really enjoying his job, a job which a few years later he’d be forced to quit when the studios disbanded in 1987 and transformed into the Hergé Foundation. 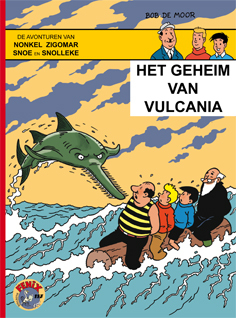 From 1 February 1954 until 25 May 1954 the newspapers De Nieuwe Gids, De Antwerpse and ’t Vrije Volksblad published the Snoe & Snolleke story “Het geheim van Vulcania”. The album has since the publication in 1954 never been published in album format, at least not in its original form, black and white that is. In 1993 the album saw a coloured album release via the Standaard Uitgeverij, however many of the drawings had been adapted to fit a coloured version – as we have shown several times already – so for many people it was still a mystery how the album actually looked like in black and white. 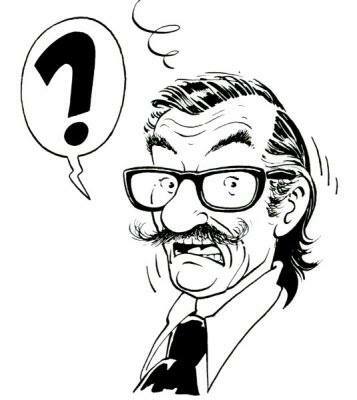 We also have to mention that a version of the black and white album had been spread by Het Belgisch Stripgenootschap, albeit in a not so good copied format, and according to our information, this version (which has been reprinted for years) is an illegal one. But luckily there is the team of Brabant Strip who have now released the black and white version of the album in their Fenix series, including the announcements as published in the newspapers. The album comes with a real cover on top. When looking at the cover you should be able to immediately recognise the hand of no-one else but one of Flanders (even Belgium’s) best comic artists, Dirk Stallaert (Nino, Mieleke Melleke Mol, Plankgas en Plastronneke, …). I contacted Dirk for some feedback. BDM: Normally it’s Bob De Moor’s son Johan who takes care of the cover artwork (after the work of his father) for the Fenix reissue series of Snoe & Snolleke. Why did you make the cover this time? Dirk Stallaert: I honestly have no idea why Johan didn’t draw it this time. 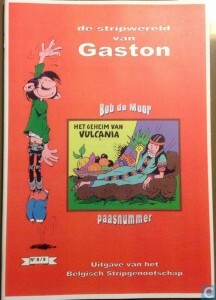 I know via Brabant Strip that he didn’t mind me drawing the cover. Maybe he just didn’t have the time for it. BDM: Have you chosen the scene (visible in the strips 37, 38) on which the cover is based or was it suggested to you? Dirk Stallaert: It was Yves Kerremans from Brabant Strip who suggested to use that scene. BDM: I suppose it’s not an easy task to invent a cover for an album, which is not yours to begin with. Were there elements in this album that made it a difficult task? Dirk Stallaert: Aaaah, it’s always a difficult task to try and get things right. Even for my own work it’s always a difficult task to make a cover and when I have to work in someone else’s style it’s even more difficult. I have just received the album yesterday and what stands out I think is the thickness of the lines… it’s quite heavy I must say and the fish isn’t flexible enough to my taste. But like I said, there’s always something to complain about. “Le plaisir de se voir imprimé” is a pleasure which I haven’t had this time. I quite like how the sky looks though. I nicked the idea from “The Black Island”. But don’t tell anyone! BDM: Ha, as always you have succeeded in perfectly representing the style though as used by Bob De Moor in the album, but keeping your own ‘schwung’ (the sawfish that is). Dirk Stallaert: I’m quite glad you have discovered the ‘schwung’, because I missed that flexibility. I had documented me really well and had first made a few sketches of the sawfish. As always the pencil sketches are a lot more fluent and expressive. 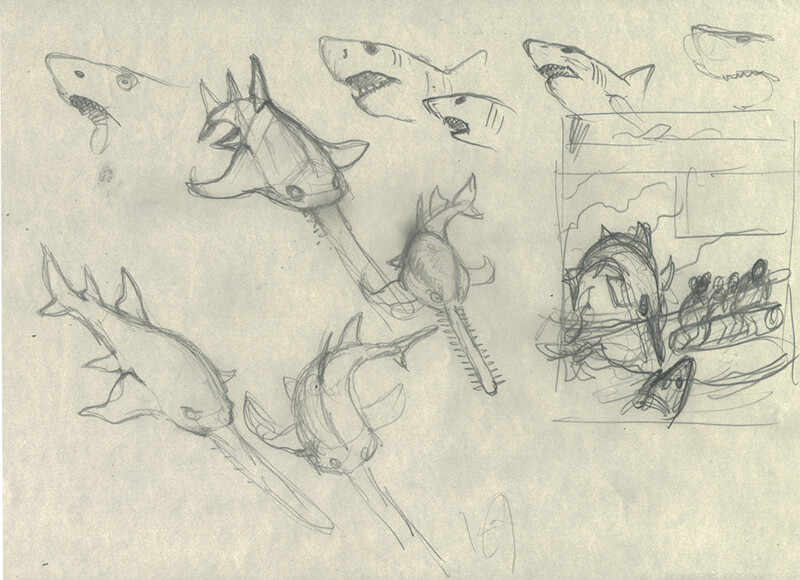 The shark which you can see in the sketch didn’t make it in the final version. It’s often a problem when using the clear line, you only have one line, and that one has to be the perfect one. While going through the archives of the family De Moor I stumbled on this cartoon which must date from the era when Bob De Moor worked for several magazines, which dates this drawing between 1946 and 1951. The drawing itself has no reference to what magazine it was published in but looking at the style used, it’s my guess it’s probably from around 1946. Nowadays this would be considered to be some kind of ‘Druivelaar-scheurkalender‘ humour as we refer to it in Flemish, indicating it sounds obsolete. But back then this was typical situational humour which people liked. But what is the most interesting is of course the drawing itself. De Moor is perfectly showing where the athlete has been jumping using several motion lines. Surprisingly he doesn’t add any expression lines around the face of madame Peeters to show her surprise. Perhaps that would have added too much extras in the drawing. The same goes for the curtains which are clearly moving. You can clearly see that this drawing was a quick job, although well executed, the characters are not really abundant in details and the whole decor is rather sober. Nevertheless, all is there and De Moor shows that he knows how to make a drawing dynamic. Final detail, that hanging lamp looks a bit odd. I have spent some time cruising through a few online catalogs to find a similar one, but couldn’t find any. If someone knows when this drawing was published, let me know at bernard.vanisacker@gmail.com and if you find that lamp, don’t hesitate to inform me too :). Info wanted: where was this bank cartoon first used and in which context? In December 2014 you could already see the first one being discussed on the Bob De Moor website. That one was kinda straight forward as far as the joke goes, but today’s one needs some extra context, and precisely that context is unclear to us (and to the family De Moor), hence why we really need some input from our readers. 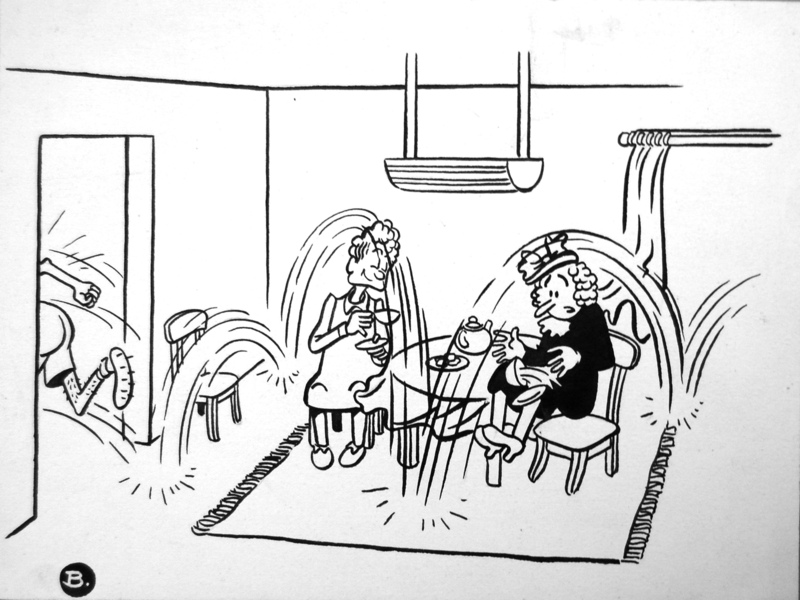 The drawing style of this cartoon is similar to the first one, and is probably made around the same time as the first cartoon, 1968 that is. 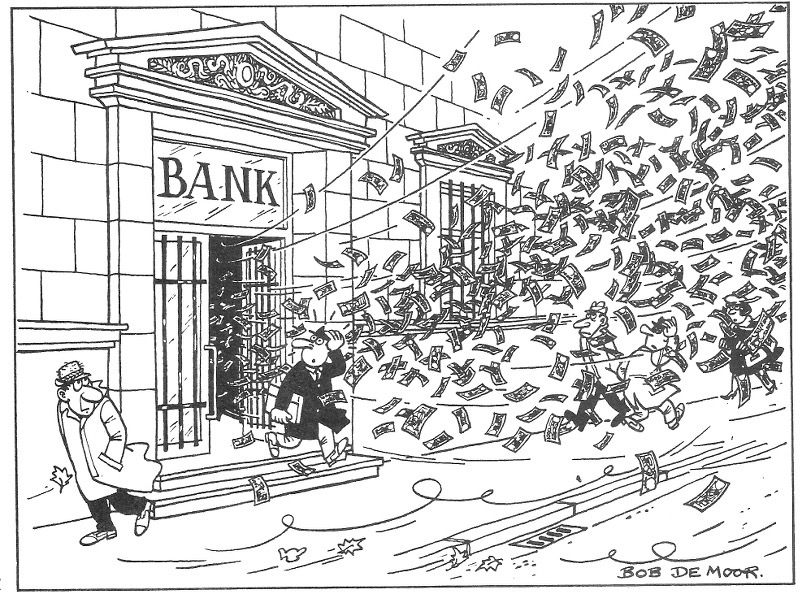 The cartoon shows a bank from which a lot of banknotes are flying out the front door. But what is this cartoon really about? You could argue that a bank usually only sees money going in through the front door and not going out, but that is most probably not what Bob De Moor referred too. Note that there is a strong wind outside as you can deduct from the people walking outside, the curly lines and leaves flying to the right. One detail suggests that there is something more going on. As you can see, the man leaving the bank looks very surprised and that is stressed by the ‘aura’ lines indicating his surprise. Perhaps that man had just left that money in the bank? Sure thing is that this person is the only one being singled out by De Moor in this drawing so something is going on there, but what precisely? It also came to our mind that this is maybe part 2 of a 2-image cartoon which Driesen might have forgotten to add. If you have extra info about this cartoon, please let us know at bernard.vanisacker@gmail.com .